So, what is up with that skull halo? Well, no – it is not alien skulls! It is a nod to The Ambassadors (1533) - which is a painting by Hans Holbein the Younger in the National Gallery, London. As well as being a double portrait, the painting contains a still life of several meticulously rendered objects, the meaning of which is the cause of much debate. The most notable and famous of Holbein's symbols in the work, however, is the distorted skull that is placed in the bottom center of the composition. 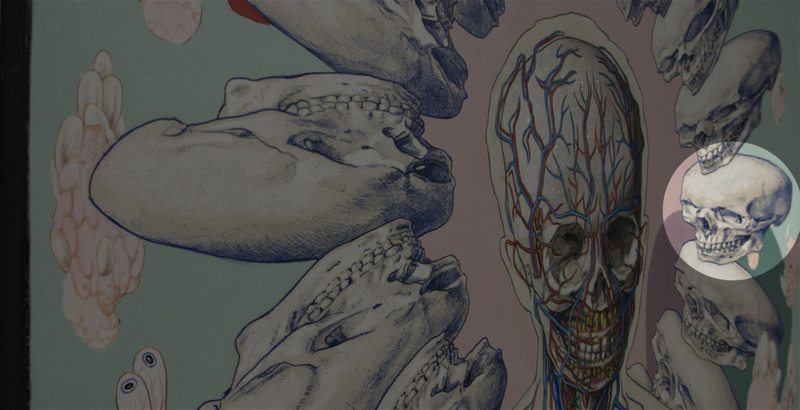 The skull, rendered in anamorphic perspective, is meant to be a visual puzzle - as the viewer must approach the painting nearly from the side to see the form morph into an accurate rendering of a human skull. However, when viewed from the side the skulls along the outer most part of the ring begin to collapse and the true “skulls” emerge. Pretty neat! Of course, it does help to view the skulls with one eye closed. The degree of distortion I employed is also significantly less than that seen in The Ambassadors. However, it does work with every skull in the ring – it just requires you to crawl all over the place with one eye closed, ha! I am sure it will make an appearance again at some point in the future!